I posted this comment on facebook, and nearly everyone mistook the meaning, assuming George referenced central California, our home for awhile, maybe as long as two years, as we take a break from big city life and obligations. By “the West,” however, George meant “the Road,” as we resume our cross-country drive, an annual tradition for twenty years, missed only once, last year, when we lived instead in a Houston hotel. Unaware of our reliance on this journey, our minds closed slowly over this past year, as our beloved New Orleans seemed louder, our responsibilities more numerous, and the return to wide-openness less accessible. We pushed our journey back repeatedly, unable to justify our wants over the needs of those who depend on us. 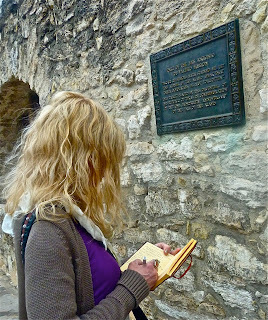 At last, we began our freedom mid-week, with a brief stop in San Antonio. 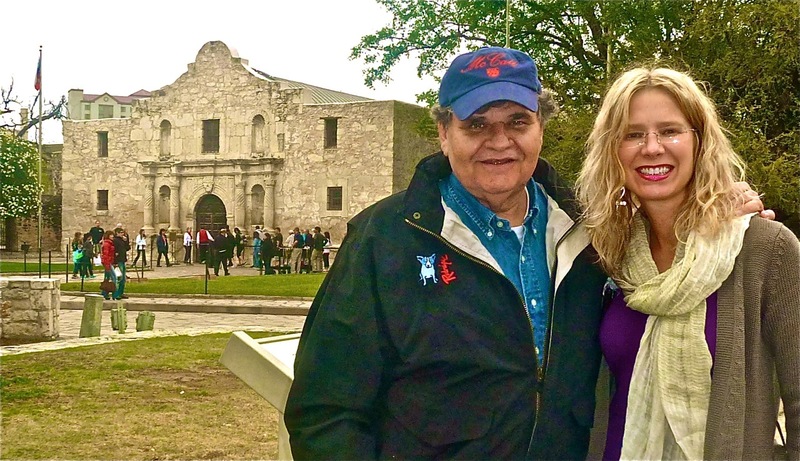 As a student at Trinity University in the 1980s, I loved this city of culture, history, and color, but I forgot, having not visited downtown in 25 years, its beauty, both inside and out, as friendly folk and mariachi bands complement the Riverwalk. Only steps away from restaurants and music, we returned to Texas history, and I recalled my mother dragging me, sobbing, from the Alamo where, at age eighteen, I stood on the memories of Texans fighting for their independence from Mexico and read the words, “Victory or Death,” addressed by Lt. Col. Travis, “To the People of Texas and All Americans in the World,” just prior to his troops’ fateful fall to Santa Anna’s army. This is why we cross America. To remember. To breathe with a deliberate exhale of relaxation, an inhale of fresh air, and a gasp of beauty and discovery. We drive this country seeking a deeper grounding within our psyches. Nothing inspires George Rodrigue more as an artist than these journeys, beginning with a freedom from commitments and the pull of well-meaning, copious plans. 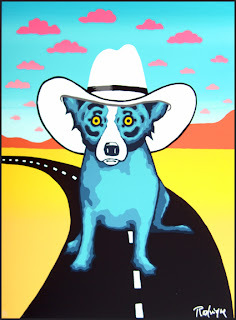 “I’m so happy not to be on somebody else’s schedule – finally,” he sighed, somewhere in the middle of Texas. Crossing into New Mexico on Good Friday, we paused in the small town of Hobbs for conversation and pie with the Robinson Family, the deliciously normal and giving provenance of Marney Robinson, Director of Education of our foundation, now fast at work preparing our Summer Art Camps. Back in New Orleans, she makes us look good while we embrace her loved ones on her behalf. 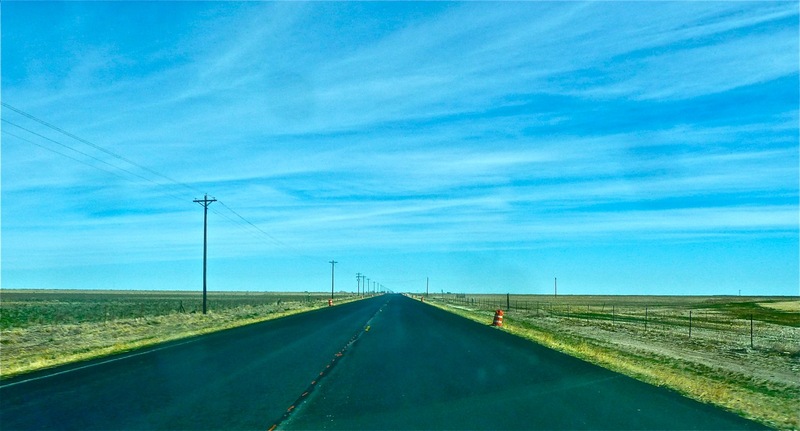 From Hobbs we drive miles of empty land, still dead from winter, but topped with bright blue skies and perfect white clouds. We wonder where the Native Americans found shelter from the sun on these once buffalo-rich plains. Did they carry the wooden posts for their tepees on their backs? How did they manage the snowdrifts, the same ones held back by fences today? 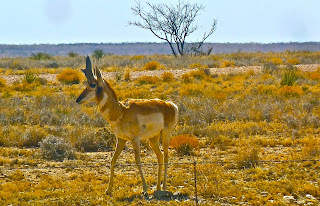 We pause at Historic Markers, one every ten miles, and we exchange long stares with an antelope, alone, and the first horned one we’ve ever seen on the road. In the six hours from Hobbs to Santa Fe, we pass only one city, Roswell, home of alien encounters, somehow appropriate on this mind-expanding journey. From our truck, we gaze across America as though we’re sailing across the ocean, towards a new day of possibilities, where anything can happen. Let’s return to Louisiana once we miss it enough, we told each other. Each ridge 4-6 ft high when built, 50 ft across top, 100 ft in between. Imagine without trees but with huts. I didn’t notice until later that alongside my notes above appear the words, “abstractions of American Modernism,” referring to artist Georgia O’Keeffe, and yet somehow fitting regarding these patterned, evenly spaced ridges and oddly shaped, unexplainable man-made hills, the largest spanning seven hundred feet across and seventy-two feet in the air. 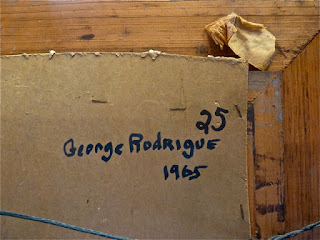 Throughout our tour, George Rodrigue recalled his lifelong fascination with the American Indian. In 1960 he won 1st place in the category of Social Science at the Catholic High Science Fair in New Iberia. He also won 1st place at the district science rally in Lafayette and 3rd place at the state rally in Alexandria. 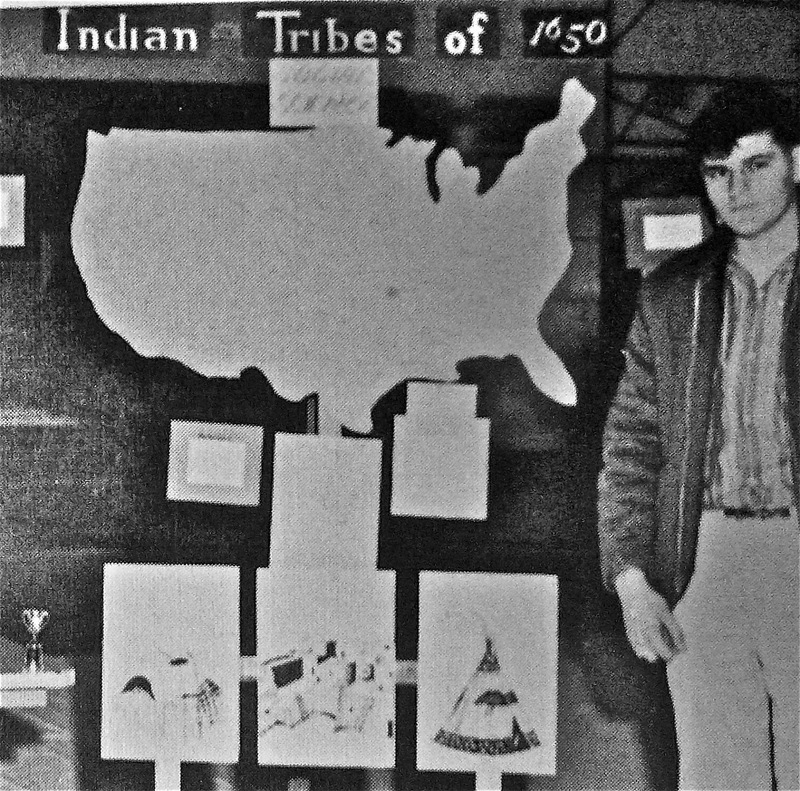 Rodrigue’s project, “Indian Tribes of 1650,” focused on the American Indian culture before the influence of the white man. The large U.S. map shows the location of tribes before any imposed migration caused by European settlers. 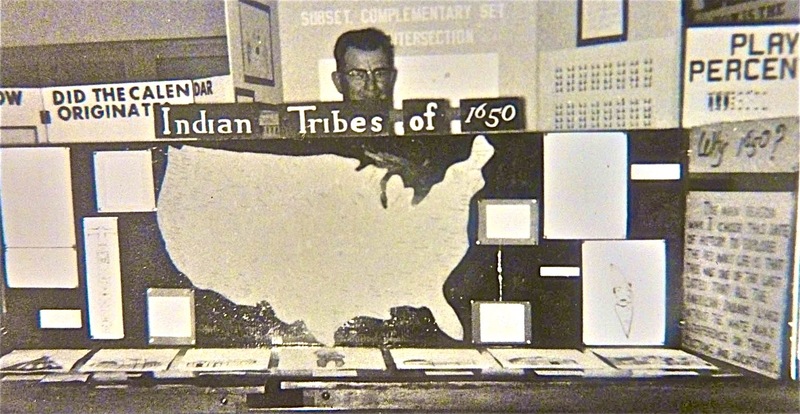 He illustrated similarities and differences in housing, clothing, and food-gathering between Native Americans within varying parts of the country. “My skill in drawing and painting had a lot to do with the success of my project,” recalls George. “I expanded the display at each level. By the time I reached State, it was four times larger than when I started. It’s easy, I thought to myself as George reminisced, to understand why the Native Americans chose Poverty Point as their home for seven hundred years. Although the modern world, such as it is in rural, mid-state Louisiana, drove out or killed the once-abundant animals, this is indeed God’s country, with wildflowers, lush grass, flowing water, shade, sun and breeze. Use your imagination, urged our Poverty Point guide. So we pictured pyramid-like structures made of earth rather than stone, the stage for ceremonies, and a focal point for people living in semi-circles around the base of the largest mass. Our imagination expanded, as we learned that the oldest mound in this area of Louisiana dates to 3900 B.C., some 1500 years before the Egyptians built the pyramids at Giza! According to archaeologists, 23,000 people lived at Poverty Point in 1300 B.C. during the height of its culture, the same period King Tutankhamun ruled Egypt. They hunted animals, wove baskets, and hauled dirt, some mounds requiring the equivalent of 16,000 dump truck loads, or 10-12 million baskets-full. 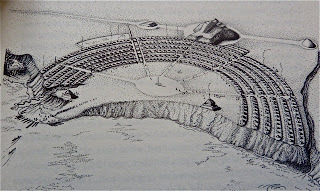 The unnamed American Indian tribe lived atop the concentric ridges, affording drainage and order for their thatched huts. Bayou Marcon was a lake at this time, and the Mississippi River flowed only three miles away. 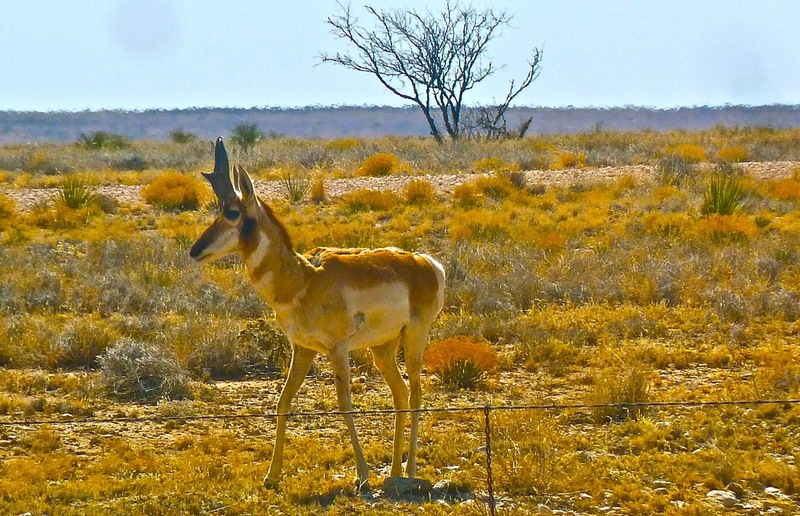 Rich with artifacts, the site boasts arrowheads, pottery shards, tools, jewelry, and evidence of baskets, as well as rocks carved with figures and animal designs, usually birds and foxes. Anthropologists believe the Indians traded baskets for stone with their contemporaries in the West. Unlike the tombs within the Egyptian pyramids, the mounds at Poverty Point reveal no ancient human remains, indicating instead cremation. The larger mounds were probably built for ceremonial use. Experts claim that this organized and rooted society was highly unusual for the hunter-gatherers (a term I had not heard since grade school). They built their mounds with determination and skill, packing the dirt in layers so that today, 3500 years of erosion later, we’re left with an anomaly: Louisiana’s Hill Country. Eventually these original Americans adopted us, fighting for a 'new' country, the place they already called home and revered as sacred for thousands of years. They created a legacy not only worth studying, but also worth visiting. On our road trip to northeast Louisiana, the area between Rayville and Tallulah, we gained a new appreciation for America’s history and Louisiana’s important role in preserving the story of our ancient world. 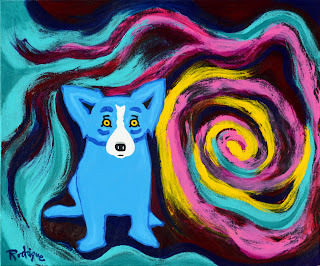 It was in Hollywood, ironically, that George Rodrigue and I reflected recently on the Blue Dog in a new way. 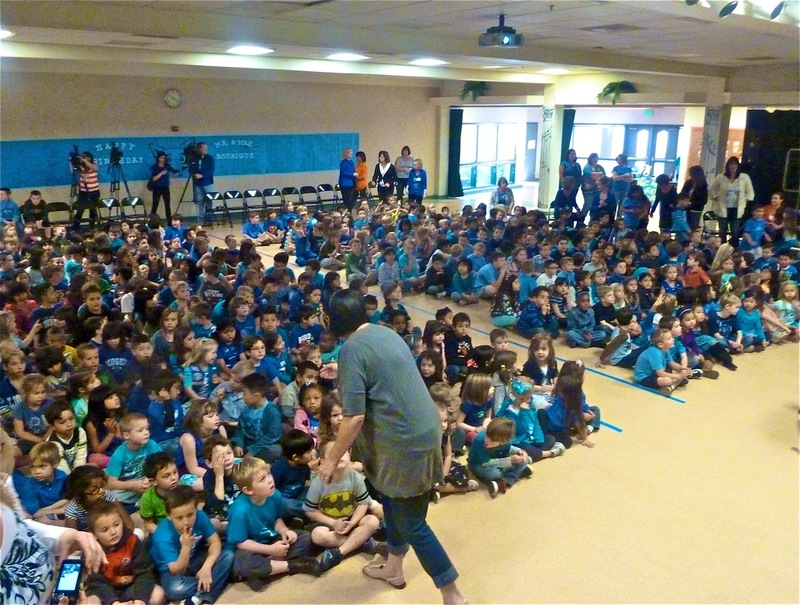 We learned of a school in southern California that used the styles of art world masters to paint Blue Dogs. 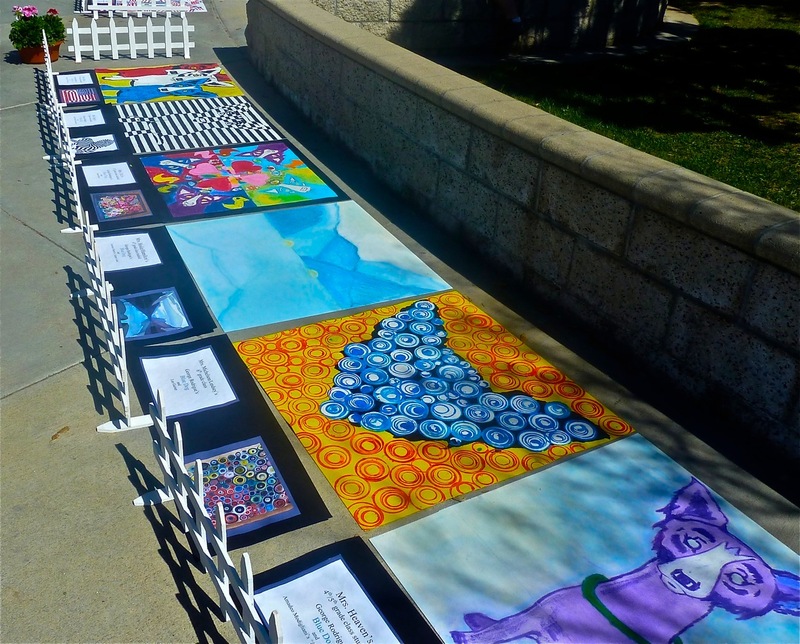 Like most school districts in America today, the school operates without any funding for the arts. Thanks to an active P.T.A. and a dynamic, dedicated art teacher, however, these students study great artists from Modigliani to Nevelson and, to our astonishment, use George Rodrigue’s Blue Dog to do it. We receive annually thousands of class projects, piled high for years in our dining room and now uploaded on-line in our student art gallery for all to enjoy. These come from Japan, New Zealand, Germany, and every state in the U.S. Yet George winces when I compare him to Picasso, the school-wide artist in my day, the 1970s. We studied Picasso because he was accessible, like George, appealing to students of all ages. Still working in his studio, Picasso wasn’t yet mythic like Michelangelo or Monet, and the idea of his existence made the art world real. What I would have given, I told students in Valencia, California last week, to see Picasso at work. 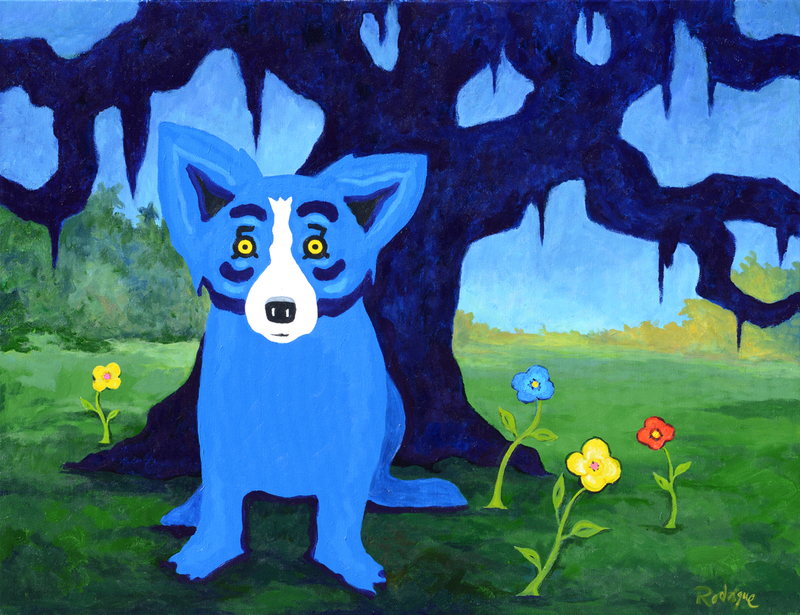 And yet George Rodrigue paints here for you and shares his story. Admittedly, we visited southern California on an unrelated mission. 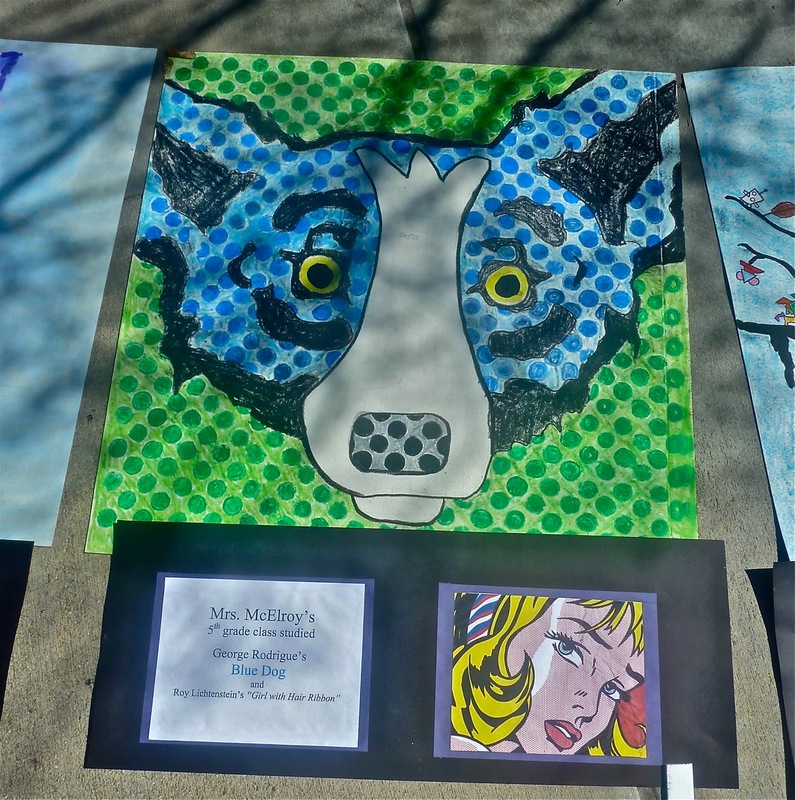 It was our foundation that suggested, since we would be in the area, that we investigate this school-wide arts program, nearly 900 students painting Blue Dogs in the styles of other great artists. They devoted their year to this project, and their preparation and welcome was unprecedented. 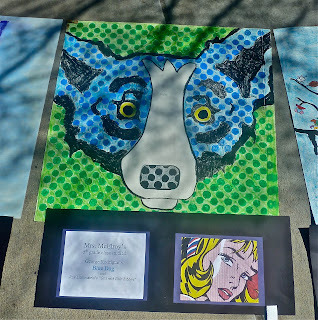 They knew everything about George Rodrigue, his Landscapes, Cajuns, and Blue Dog, so that their anticipation fed ours, intensifying as we arrived, greeted by students, teachers, community leaders, journalists and large-scale class projects constructed on linoleum squares. 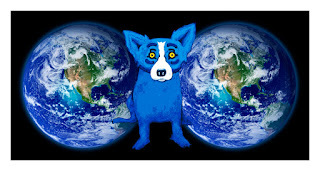 The Blue Dog has always had a life of its own. Museums from Memphis to Frankfurt continue to elevate the work beyond kitsch with exhibitions since the 1990s. 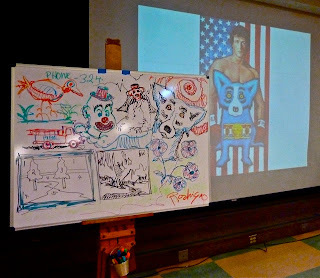 Yet it was this school visit, our first in California, that impacted George Rodrigue more than any museum. 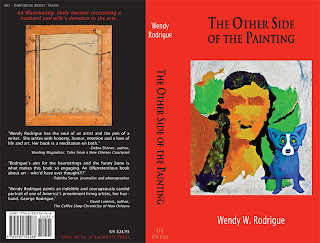 “I never once considered myself in league with artists like Miro and Mondrian, yet this school saw my art in these terms and spent a year connecting the Blue Dog to other artists and tying it to a higher level. We shared with the children during two lectures and demonstrations, yet it was their questions and enthusiasm that made this school visit, more than others, such a success. With only a loose plan, we share the art according to the level of interest. This varies not only among ages, but also among regions. In this southern California school, for example, I focused on George’s years at the Art Center College of Design, just thirty miles from North Park Elementary. I talked about his portrait of President Ronald Reagan, which hung for years in the Reagan Library in nearby Simi Valley. And, I shared the unique role that Californians played in the Blue Dog Series. George also shared with the students their good fortune in studying the arts, something unavailable and unappreciated in many schools, even today. 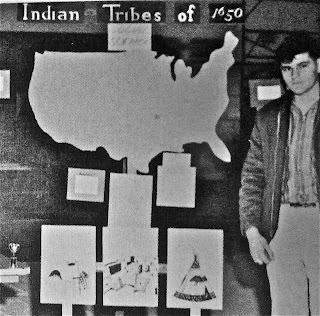 In 1950s New Iberia, art was non-existent in Louisiana schools. “I didn’t have the opportunity to study and emulate great artists. I drew things I liked, and the first original painting I saw was my own. Sixty years later I still paint the way I felt as a child. I emphasize to students how important it is to retain that innocence, and that it’s okay to create art in this way. The school visits and our work with the George Rodrigue Foundation of the Arts (GRFA) represent both a legacy and new direction for George and the Blue Dog. One would think that the growing museum attention would spark this momentum, yet the children are the future, and they are far more important. Oftentimes it takes others to point out our achievements. What begins as small and for oneself can become something else. 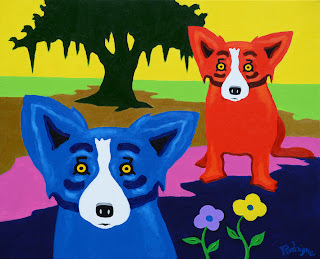 George Rodrigue paints today with confidence, sure of both his brushstrokes and direction. 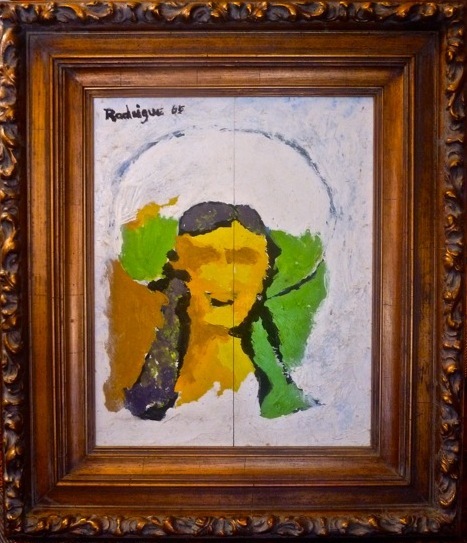 His paintings are steps towards expounding his vision, whether within a specific series or his career’s oeuvre. But this was not always the case. In 1965 Rodrigue was a student at the Art Center College of Design in Los Angeles. He learned from professional artists and, for the first time in his life, thought of art in abstract concepts, beyond illustration. Although he also studied advertising design, his painting classes focused on fundamentals and technique, as well as the visual transmission of his soul, the impartation of mystery. From his early twenties, art shifted from illustrating a specific idea to eliciting an emotional response. 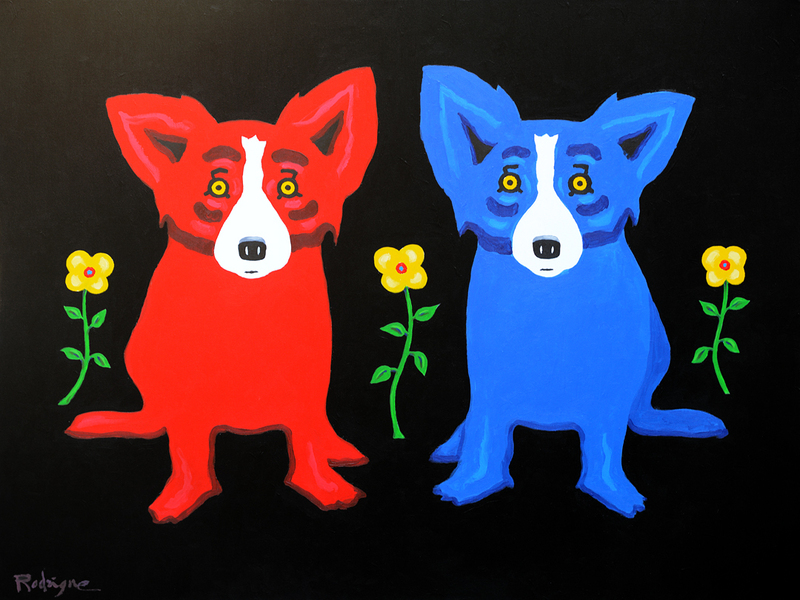 To create the untitled painting above (1965, 24x18), George Rodrigue, strapped for cash, rather than purchase a new canvas, glued together two pieces of thin, shiny illustration board. Normally, in presenting a design to clients, he taped his illustration to a press board, covering it with a two-inch matte to hide the tape. 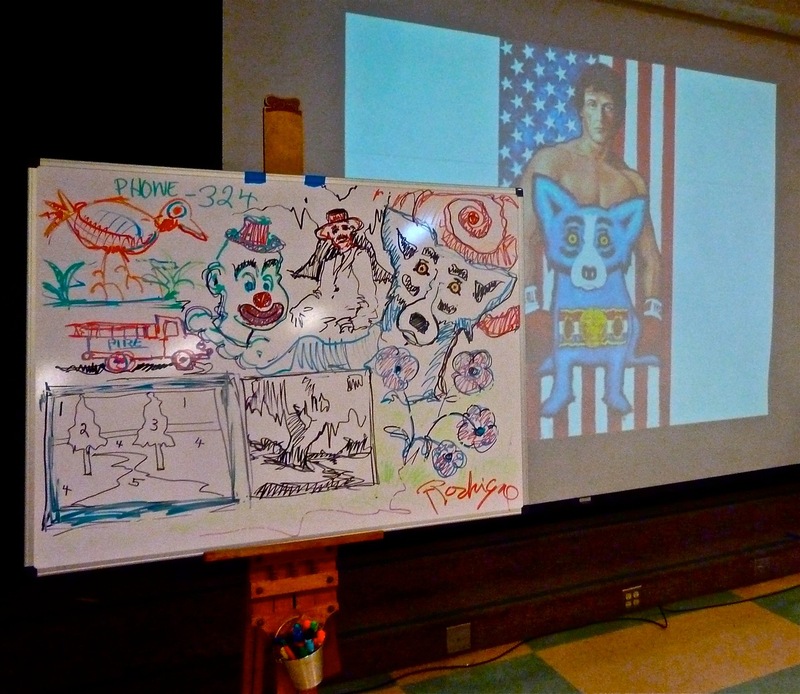 Here, however, in a painting class, without concern for clients and their products, he created a makeshift canvas, backing the two pieces with a single heavier sheet of pressboard, all discarded materials from his class in advertising design. Years later, he stapled the assembled pieces into an expensive, museum-quality frame. “As I started painting from the model on my glued-down illustration board,” recalls George, “the teacher asked me what I was doing and noted that, without a canvas, I should at least use a single piece of board. 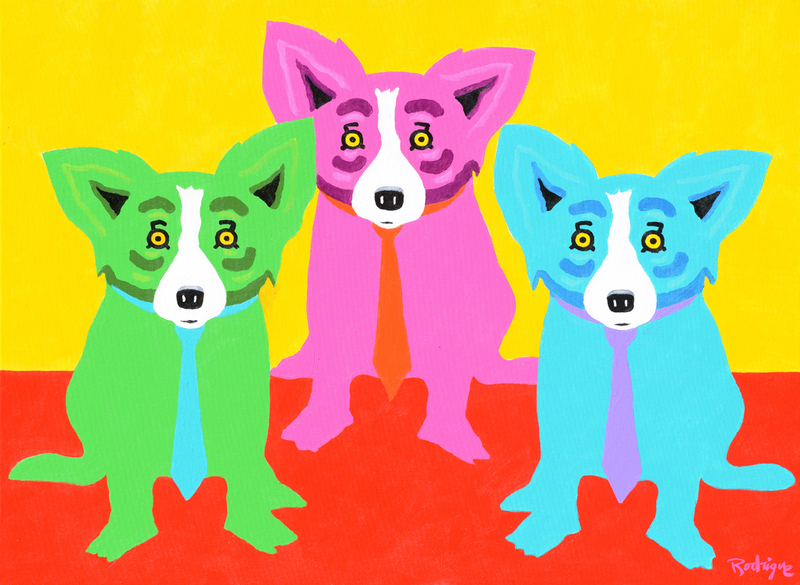 The scenario was a lesson for Rodrigue. Until this point, he looked at a finished painting, whether a portrait, landscape, or still-life, as best representing its subject, literally. The assignment was simple: paint the model. And yet, in stopping when he did, George’s interpretation becomes a visual enigma. For years, visitors to his studio, especially other artists, asked him when he would finish the painting. “It’s finished, I told them. Similarly, I started blogging four years and four hundred essays ago mainly to answer the questions of students, collectors and journalists. 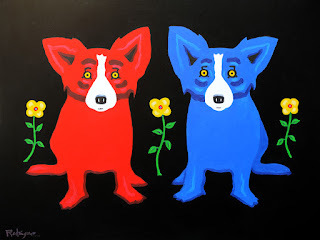 Musings of an Artist's Wife began as a source for basic information about the art of George Rodrigue, such as the story behind Jolie Blonde, the origin of the Blue Dog, and the pronunciation of the artist's name. Yet from the beginning, George was my professor, seeing something else. He encouraged me to drift away from rote answers and instead explore tangents, including not only my observations of his work, but also the nostalgia and perception unique to me and my life. In a way, my audience also guided me, because, as I dared to share the personal and obtuse, those same stories, the ones with obscure references and unanswered questions, drew thousands of readers, oftentimes more than the literal Rodrigue specifics that spawned the blog in the first place. Like George sitting down to an assignment to paint a model and nothing more, the blog became something else. It’s as though we turned over the pieced-together, painted board and, like the other side of the hit record, found something unexpected, something important and true, and, just like the unfinished ‘finished’ painting, something that was there all the time. 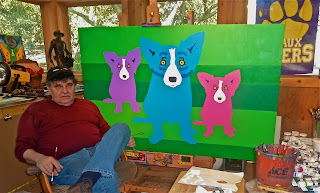 As a result of last summer’s sidetrack, George Rodrigue and I missed our annual time in Carmel, California, returning just this week for a year, maybe two, as we seek something still ill-defined. We have yet to analyze his near-death experience or rather, our second chance, referring often to the excuse, “it’s still too new,” as our reason for avoiding the harsh reality of cancer events while embracing the happy ease of school visits and student art contests. George searches for answers in his art, yet in New Orleans, where he’s painted feverishly forty canvases since last fall, he reassesses his life before reassessing his art, because he can’t help it in that city of over-stimulus, because to reach the heart of the matter, again, “it’s still too new,” and we have to get out of the city and know quiet for a while. The same is true in art. George Rodrigue describes his years at the Art Center College of Design in Los Angeles as both frustrating and liberating. He learned from professional artists he admired and emulated, yet he noted these champions of the abstracts’ rejection of anything new, specifically, during those mid-1960s Pop Art years, a strong denial of the commercial and literal in art, an ironic rebuff given Art Center’s focus on advertising design. Today, in writing these essays, I face the same challenges. I reflect on George’s battle with cancer, still too new to discuss in detail, and yet a giant, abstract lesson looming, waiting to change our lives, to change his art. 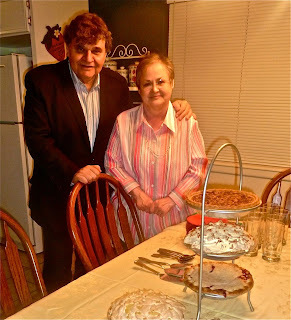 In fact, unable to face the big picture, I managed to write for months about his disease without mentioning the word itself (see the posts from June through September of 2012 in the "Blog Archive" to the right of this essay). I watch him paint, and I recognize something as different, yet I’m too in the middle of it to articulate the changes, and he’s too in the middle of it to broach the emotions with anything but a subtle reference in his art or discussion. This is true of not just his illness, but rather of all life experiences. It is only today, for example, that we can look back on an artistic project like the Xerox Campaign or a disaster like Hurricane Katrina and study them as turning points in George’s art as much as in life. "I realize more today than ever," says George, "that Europe had to experience the Dark Ages in order to have the Renaissance. Art reinvents itself by people who go through things that they may not understand at the time. There's always hope that new generations will discover new things that eventually propel society forward. "For lack of a better word, I feel now a renaissance in the way I look at things and in the way the Blue Dog looks at me." Sometimes it all becomes clearer when we allow others to observe and conclude for us. Author Patty Friedmann wrote the foreword to my book (due this fall, UL Press), and her words struck me physically, to where it’s agonizing to realize that someone, until recently a stranger, gets me so well, understands my labyrinthine style, and yet actually likes it. It’s hard to read her words and not breathe less steady and wonder how she managed from my muddle to get the picture. Through our foundation, George and I work often with children. The young ones especially see with untainted eyes. Unafraid of mistakes or stupid questions, children are perfect in both their art and observations. I watch them, as I watch George, who somehow retained this freedom throughout his 69 years, and I try to ease open my brain, relieving age-induced cynicism, prying even harder at my heart, that I might contribute in some way towards widespread sincerity. For about two years in the mid-1990s I played cards with an old Western character actor in the Carmel Highlands. We met through a mutual friend, who arranged a rare introduction to this cowboy-hermit who, by his own admission, had not left his house since the 1970s. I lost $40 to him on that first day, as we played cards on a rotting wooden picnic table overlooking the whales and Monterey Bay. Suspecting I might not return, he struck a deal. I wouldn’t have to pay, provided we never play cards for money again. He acted in more than one hundred movies and TV Westerns and, although smoking unceasingly the marijuana he grew on his property, he remembered every card, so that my (sober) gin game no longer honored my grandfather’s memory. From time to time, the big name actors stopped by to pay their homage or supply their stash, and I knew that, provided I remain calm and sworn to secrecy about the drugs, stars, and our rendezvous, I could stay. Other than my mother, I kept my word until this essay and continue to keep my word regarding his name, although, honestly, you won’t know him, unless, like my mom and my husband, you’re a 1950s and 60s cowboy movie buff, in which case you might recognize his face from TV or possibly a big picture. “Oh yeah!” said George, when I showed him a photo. Like many men, the actor fell for my mother, and during her visits, they danced in the expansive property’s crumbling, dusty ballroom, as I swapped out waltzes on the turntable. “I can’t believe you never told me,” said George this week as I recalled the story. Although George and I dated during those years, I still kept the actor’s secret, because he didn’t want to meet my love interest. “Artists!” he exclaimed more than once, eventually forbidding me to speak of mine. He only wanted a card-player and her mother, and we, the three of us, rather liked the intrigue. I write this morning to the “Welcome home!” of two great horned owls. * Their lives too were disrupted, as only one owl visited for several years, now partnered again for the sunrise ritual at the edge of our pool, at this point more their pool than ours. I’m sure they noted our return, but I wonder if they noted our absence. And I wonder if they protected the property, keeping at bay the R.O.U.Ses. The owls sing in chorus, delivering some message that I’ll probably grasp as part of the big picture in the future, because at this moment I’m too swept up in the details: the fire warming the room, the memory of a cowboy who, as I just learned on-line, died eleven years ago, and the artist snoring softly beside me.